↑ तिवारी, निमिषा (30 अक्टूबर 2006). "Himesh does the nation proud" (अंग्रेज़ी में). मुंबई: द टाइम्स ऑफ़ इंडिया. टीएनएन. अभिगमन तिथि 7 जून 2018. ↑ "Jodi No.1 (Original Motion Picture Soundtrack) by Himesh Reshammiya & Anand Raj Anand" (अंग्रेज़ी में). 26 फरवरी 2001. अभिगमन तिथि 7 जून 2018. ↑ "Aamdani Atthanni Kharcha Rupaiya (Soundtrack from the Motion Picture) by Various Artists". 1 जनवरी 2001. अभिगमन तिथि 8 जून 2018. ↑ "Kyaa Dil Ne Kahaa (Original Motion Picture Soundtrack) by Himesh Reshammiya". 12 अप्रैल 2002. अभिगमन तिथि 8 जून 2018. ↑ "Humraaz (Original Motion Picture Soundtrack) by Himesh Reshammiya". 6 मई 2002. अभिगमन तिथि 11 जून 2018. ↑ "‎Chalo Ishq Ladaaye (Original Motion Picture Soundtrack) by Himesh Reshammiya". 27 दिसम्बर 2002. अभिगमन तिथि 2 अक्टूबर 2018. ↑ "Chura Liyaa Hai Tumne (Original Motion Picture Soundtrack) by Himesh Reshammiya". 20 नवम्बर 2002. अभिगमन तिथि 2 अक्टूबर 2018. ↑ "Footpath (Original Motion Picture Soundtrack) by Nadeem - Shravan" (अंग्रेज़ी में). 15 अगस्त 2003. अभिगमन तिथि 2 अक्टूबर 2018. ↑ "‎Tere Naam (Original Motion Picture Soundtrack) by Himesh Reshammiya & Sajid-Wajid". 28 जून 2003. अभिगमन तिथि 3 अक्टूबर 2018. ↑ "Zameen (Original Motion Picture Soundtrack) by Himesh Reshammiya". 16 अगस्त 2003. अभिगमन तिथि 3 अक्टूबर 2018. ↑ "‎Bardaasht (Original Motion Picture Soundtrack) by Himesh Reshammiya & Anuj Matthews" (अंग्रेज़ी में). 1 दिसम्बर 2004. अभिगमन तिथि 3 अक्टूबर 2018. ↑ "Run (Original Motion Picture Soundtrack) by Himesh Reshammiya". 14 मई 2004. अभिगमन तिथि 3 अक्टूबर 2018. ↑ "‎Julie (Original Motion Picture Soundtrack) by Himesh Reshammiya". अभिगमन तिथि 3 अक्टूबर 2018. ↑ "22 साल की शादी के बाद ऐसे पत्नी से अलग हुए थे सिंगर हिमेश रेशमिया– News18 हिंदी". News18 India. अभिगमन तिथि 7 जून 2018. ↑ "Himesh Reshammiya Wedding: हिमेश रेशमिया-सोनिया कपूर ने रचाई सीक्रेट वेडिंग, सामने आई शादी की Photos". hindi.timesnownews.com. अभिगमन तिथि 7 जून 2018. 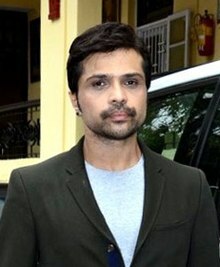 ↑ "Sonia Kapoor-Himesh Reshammiya Marriage: विवाह बंधन में बंधा जोड़ा, देखें शादी की शानदार तस्वीरें". NDTVIndia. अभिगमन तिथि 7 जून 2018. ↑ "'Black' bags major IIFA awards". प्रेस ट्रस्ट ऑफ़ इंडिया (अंग्रेज़ी में). दुबई: द ट्रिब्यून. 17 जून 2006. अभिगमन तिथि 7 जून 2018.